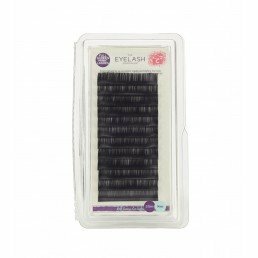 Give your clients individual eyelash extensions which will stay soft and hold their curl. Our tray lashes help to speed up treatment time as each tray features lashes set out in different sizes, all perfectly positioned at the right angle for application. Simply tweeze out individual lashes straight from the tray or pull strips from the tray and stick to the back of your hand or bridge ring. Made from advanced PBT polymer, all our individual lashes are of a consistent high quality. With individual lahes from the Eyelash Emporium you can give your clients remarkable results with every treatment.